Every day stuff we all love to hear about. I remember back in the 90’s when those in the technology industry were decrying COBOL and how much of our infrastructure ran on that aging platform. This, of course, was exacerbated by the Y2K bug as the rollover to the year 2000 really put a face on just how old COBOL really was/is (2000 put that face on many other things as well). Not a fully featured object-oriented programming language. VB6 did not fully implement inheritance, for example. Not a stable programming environment. VB6 would sometimes crash costing the programmer hours of work if it was not already saved. VB6 allowed many dangerous programming habits. For example, the way it treated NULLS and its implicit type casting. Despite all these failings, VB6 was used by tens of thousands of programmers for projects ranging from small calculator programs to software that, even today, runs major businesses – including banking. Because of its simplicity and the way it hid so many of the more difficult aspects of programming, VB6 allowed people who never would have given programming a second thought the chance to create major software. In VB6, you were never expected to handle pointers, do recursion, or do your own garbage collection. VB6 hid all those things from you. With such ease-of-use that allowed even mediocre programmers to develop complex programs with user friendly graphical user interfaces, it is no wonder that there are probably millions of lines of code written in VB6 running today. It was cheap and easy to get otherwise hard stuff done. But, like all other things in the computer world, life moves on – very quickly. VB6 was replaced by Visual Basic .Net in 2002. Today, Visual Basic 2012 is about to be released in a couple more months. Looking at Visual Basic 6.0 side-by-side with Visual Basic .Net is like looking at night and day. Visual Basic .Net is a fully object oriented programming language with all the modern bells and whistles that come with that title. Indeed, VB .Net is right on par with other languages such as C++, Java, and C#. However, what about all those programs written in VB6? Many of them – too many – are still here. Major corporations such as Corning, Guildford Mills, General Motors, etc. still have entire sections of infrastructure based on VB6. Those sections of infrastructure have been in use for years and years. It’s very difficult to incur expense in the form of not only new programming talent, but also in the form of downtime to replace these sections of infrastructure that have been running for years and years. Not only that, but in many cases the original programmers aren’t around anymore. They’ve either quit, retired, or gotten laid off and refused to come back when the company realized the mistake of letting them go. So now we have entire sections of infrastructure to maintain, and try to replace, yet those with the experience on how it all runs are no where to be found. The same thing happened with COBOL. And, yes, COBOL is still in use today. VB6 is truly the COBOL of our time because it was good at what it did. It allowed people, even those that weren’t good programmers, to come up with simple solutions to hard problems without breaking the piggy bank. Something tells me that in the year 2020, VB6 will still be here. This is a MUST READ for anyone who deals with security (a.k.a Everyone). Paul Thurrott is one of my favorite authors and I do follow his blog religiously. Paul has written books such as Windows 7 Secrets which can be found on Amazon.com here. He is also currently working on Windows 8 Secrets, his book about the new Windows operating system due later in 2012. Be sure to check out his site – I have the link on the right. Raymond Chen is my programming god and I also follow his blog religiously. He is a developer at Microsoft on the Windows Shell team which is Windows Explorer, the Start Menu, and desktop. He also has a book at Amazon.com, The Old New Thing, which is a must-read for all Windows developers. Do check out his blog, The Old New Thing. Again, link on the right. A few years ago, I was not able to go to one of the big Microsoft events of the year after spending a lot of time planning to go. However, Paul and Raymond were going. So, I got brave and emailed both of them, explaining my plight, and I requested a picture of the two of them together. I honestly did not expect a response so imagine my surprise when they both responded and made plans to meet each other! They even kept copying me on the email exchange – including sharing phone numbers! I barely expected them to respond, but to actually charge me with that kind of trust was shocking to say the least. I found the picture digging through my files so I thought I would share. 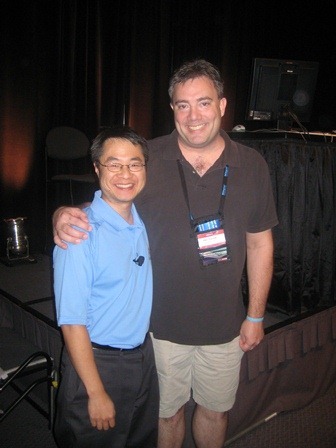 Raymond Chen (left) and Paul Thurrott (right). If you have a spouse and/or kids, they have to understand that once you walk through the door of your office, even though that office may be a converted bedroom, you are at work. You are not available for family stuff. My wife, in the beginning, had a very difficult time with this concept. To her, it just didn’t make sense that I couldn’t spend 10 minutes vacuuming the living room or emptying the dish washer because “you’re right there in the next room.” Also, husbands have to understand that you can’t always stop to cook for them or do some other “wifely duty”. If your children are home for the summer or on some other type of vacation from school, then you may have to put them in some daycare or your spouse, if available, will need to keep them occupied for you. You cannot have a six year old demanding food or play time while you’re on a conference call with a client. Also, family must understand that just because you step out of your office to get a quick drink or have lunch doesn’t mean you suddenly have all kinds of free time to give to them. It’s easy to not worry about combing your hair, shaving, getting dressed, brushing your teeth, etc. when you work from home. However, you really should keep those things in mind and you should still do them. Once you start letting yourself go, you’ll be surprised at how those bad habits will creep into your social life. Next thing you know, you’ll be at friend’s houses or family reunions looking/smelling like trash. Despite the fact that you have no co-workers around you and that your journey to work is a mere walk across the house, you should continue to maintain good hygiene and dress like you are going to work. Most of us barely exercise enough as it is. At least the walk from the car to the office of a real firm is something and you do walk a little bit when going to meetings or looking for co-workers for help. When you work from home, however, your already low amount of exercise turns to a flat out zero. You’ll find yourself getting out of shape even worse than you are now which will not bode well for your work performance. You must, when working from home, make some time for physical activity. The living room, with all of that entertainment equipment, will do nothing but distract you. Do not turn on the TV, do not turn on anything. You may think you’re just checking the weather real quick, but I can assure you that 10 minute weather forecast can easily turn into the third episode of a Star Trek marathon on Spike TV. As for the kitchen, marching there to get snacks or something to drink every few minutes will do nothing but drain your productivity while stacking on the pounds. Avoid the living room altogether and make sure your visits to the kitchen are measured and infrequent. Co-Workers who have to drive to the office will always be jealous of you. Your boss will always be suspicious of your productivity. These are things you’ll just have to accept and deal with. While you’re dealing with distracting family members and trying to stay focused, they all think you’ve got it made. I hope these tips help. I may revisit this topic in the future if I think of anything else. Working from home does have advantages, such as the amount of money I save in fueling the car, but there are clearly some negative attributes to deal with as well.